For just a pocket under the chin, either truSculpt 3D, a quick painless 2 treatment protocol may do the trick by killing the fat cells which will metabolize out of your body within 3 months. truSculpt also tightens skin, so this single option may do the trick alone! Another option is Kybella. This injection causes fat cells to break and they also are metabolized out naturally. While incredibly effective, you will be swollen for up to 2 weeks. Most people need 2-3 treatments. 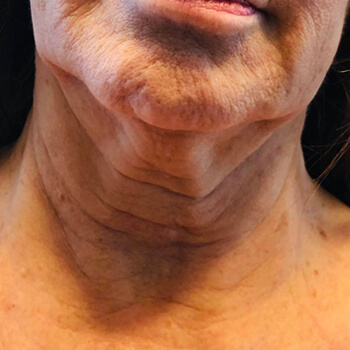 It’s not painful, but the swelling is noticeable which is why ‘scarf weather’ is the perfect time to do this procedure. 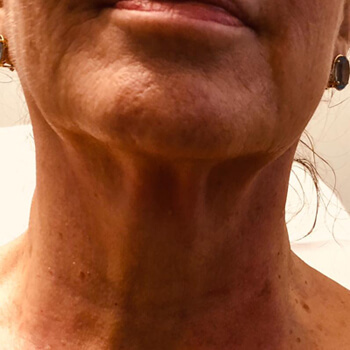 Using painless and very effective radiofrequency and ultrasound with our Exilis Ultra machine tightens skin significantly creating the final gorgeous result. See this before and after photo taken on a 67 year old woman. No fat reduction, just skin tightening and this image is after just one treatment! It’s important to note that these treatments for fat reduction are permanent. Though skin laxity will continue (yeah, we keep aging), the fat destruction is permanent! Many times the double chin is partially caused by a less than optimal jawline. We can sculpt the jawline using Radiesse, which will last about 8 months before you would need a touch up.